We hear this phrase a lot: guard your heart. Is guarding your heart a defensive maneuver meant to shield us from hurt? If that is true, does it mean isolating ourselves from others? Is it strictly for those that are dating? If it is about protection, that seems to contradict what God tells us other places in scripture. God commands us to love, be light, have compassion, and be humble. How can we do that and guard our heart? How on earth does this all connect? C.S. Lewis captured the tension in his book The Four Loves. Anchor your identity in Jesus: We could end the conversation here really. The first part of Proverbs 4 talks repeatedly about gaining insight and wisdom. Proverbs defines wisdom as the fear of the Lord and insight as the knowledge of God (Proverbs 9:10). So in context, we guard our hearts by knowing, loving, and pursuing a relationship with God. This relationship is the only secure, safe relationship. The only one that won’t hurt or disappoint us. Jeremiah 17:9 tells us how deceitful our hearts really are. As a result of our deceitful hearts, we seek to find our identity in things other than God. In doing so, our hearts are left unguarded. Life and relationships are full of hurt. The intensity of the hurt and the ability to recover depends on where you place your identity. Is it in God? If it is, then when life becomes hard and painful your boat won’t sink. Is it in a job, talent, or relationship? Watch out…you anchor is thrown into a neighboring boat and a storm is coming. Anchoring your identity in the depth of God’s love for you allows us to love, be vulnerable, and risk because we know we are first and foremost forever loved by God. Perhaps thats why God commands us to love Him first before we can love others. (Luke 10:27). Click here to read more: We Dig: The Daily Struggles with Addictions and Idolatry and Identity Attacked. Knowing and celebrating how you are uniquely made serves to protect us from comparison and guide our choices. Not sure about how God designed you…seek out personality tests that can help you figure it out. Draw close to God and ask him to show you. Consider what gives you energy and excites you. All these things will help you on your journey to discover your purpose and passions. Have realistic expectations: Expectations unconsciously drive our emotional reactions. If what we expect happens, then we tend not to notice it. BUT, if what we expect doesn’t happen….then watch out….we feel violated, irritated, annoyed…and we react. All of this happens in a split second without a lot of thought involved. The problem comes if our expectations are unreasonable and unrealistic. See we live in a broken world with other broken people. We want (and need) others to give us grace but we often don’t expect to have to give it to others. People demonstrate who they are over time. Whether you agree with how they choose to be in the world or not, they are who they are. Are your expectations based on the real and not what you wish or hope for? 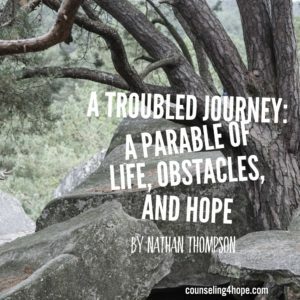 Life involves difficulty and struggle. Do you expect things to be difficult at times or do you have idealistic expectations? Realistic expectations help guard our hearts from unnecessary emotional reactions and pain. 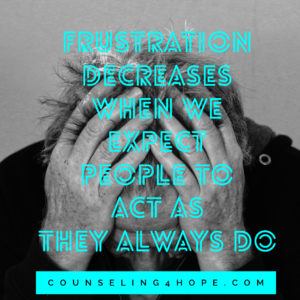 Read more about expectations and reactions. Keep safe friends: Safe people accept us for who we are and don’t try to change us. They are trustworthy, compassionate, real, and care for us as we care for them. These are (or should be) your best friends. 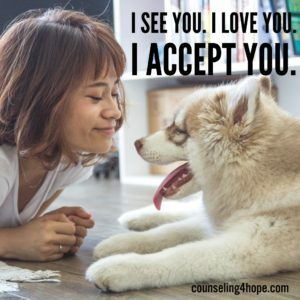 These friends help you guard your heart because they love you, know you, and accept you. If you find yourself withdrawing from these safe friends, think about why. Reflect on the person or circumstances. 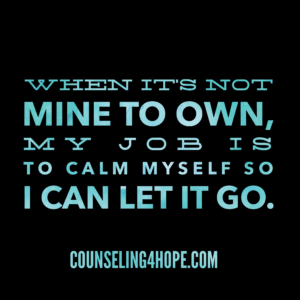 Pulling away from safe people is a warning sign that we may not be guarding our heart well. If we are in close relationship with people who are not safe, than our heart is unguarded because we are in relationship with someone that doesn’t love the real you. This can leave your heart unnecessarily exposed. Read more about safe people here. Set boundaries when needed. Fences around our yards are the best visual for boundaries that I can think of. If a tree falls in my yard, than I know it is my responsibility to clean it up. If a tree falls in my neighbor’s yard, that’s not my responsibility but his. We all have personal boundaries around our soul. 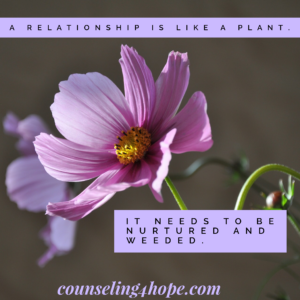 They are emotional, physical, mental, and relational. Just like a fence, we all have imaginary gates that allow things in and out of our soul “yard”. Some of us never learned we had a gate and so our gate is stuck open….everything comes in to impact our soul. Learning how to close your gate, learning what is yours to own, and learning what to take in or let go is all a part of boundaries. 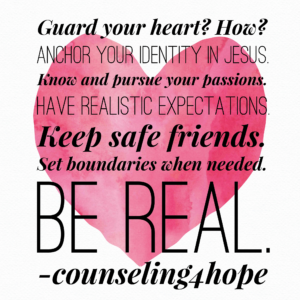 Boundaries guard our hearts. Read more about boundaries here. Be real: We all love people who are real. Who don’t hide…who share their imperfections…and own their strengths and weaknesses. It draws us to them. These people appear confident and we envy their confidence. It’s not confidence as much as embracing who they are and being real. Hiding our imperfections and weaknesses while only presenting our strengths or a mask breeds shame and self-criticism. This is highly toxic to our heart. “Perfectionism is a self destructive and addictive belief system that fuels this primary thought: If I look perfect, and do everything perfectly, I can avoid or minimize the painful feelings of shame, judgment, and blame.” (Brene’ Brown, The Gifts of Imperfection). Embracing who we are (warts and all) and bravely sharing that with the world guards our heart. 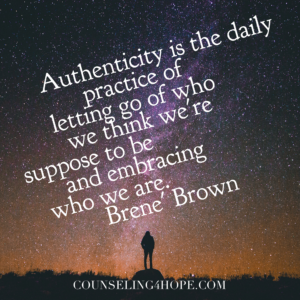 “Authenticity is the daily practice of letting go of who we think we’re supposed to be and embracing who we are.” (Brene’ Brown, The Gifts of Imperfection). Read more about embracing imperfection. So guarding our heart is more complex than most people think and it’s definitely not about isolation and protection. It’s loving God first and then loving others in a healthy way. 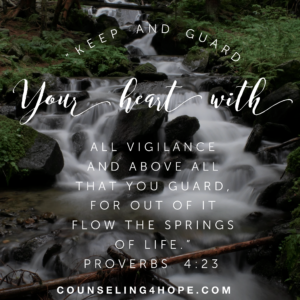 So how are you doing at guarding your heart? Need help with any of these ideas….seek out solid resources or find a counselor. There is always hope!